I’m a big fan of meringue cookies. I’ve certainly made enough of them since I’ve been on this low carb diet. So far I’ve shared recipes for almond meringue cookies, chocolate meringue cookies, jello meringue cookies, and an all together different sort of lemon meringue cookie. So today’s recipe fits right in. I just love these crispy airy cookies. And they are a low carb no brainer with only 4 calories and nearly 0 net carbs. They are basically a free food. And they taste like a delicious lemony pocket of air. These low carb lemon meringue cookes are zero carb treats are crispy and light and full of lemony flavor. 1. Preheat oven to 250 degrees F and line a baking sheet with parchment paper. 2. Add cream of tartar to the egg whites and beat with an electric mixer on medium-high speed until soft peaks form. Slowly add sweetener, about 1 tablespoon at a time. Continue beating until the whites are stiff and glossy. 3. Fold in lemon juice and zest. 4. Spoon or pipe mixture onto the parchment covered cookie sheet. You should have about 12 meringues. 5. Bake for 18 to 20 minutes at 250F. Then reduce oven temperature to 200F and continue to bake for another 18 to 20 minutes, until crisp and tips are just starting to brown. 6. Turn off oven and let meringues sit inside for 2 hours or longer. 7. Remove and carefully peel off parchment. would these cookies be an okay choice for a diabetic? Yes. these cookies are very good for a diabetic. They are basically a zero carb food, so they won’t effect blood sugar. I’m a diabetic and I make these all the time. Can I use regular confectioners sugar? 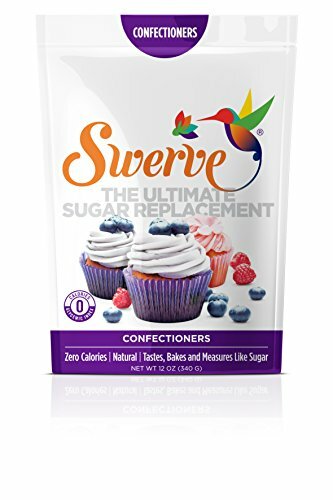 Yes, the two confectioner sugars are interchangeable in this recipe, but the cookies wouldn’t be low carb. Can I use “eggbeaters” eggwhites for this? Am never sure if they have the same properties as fresh eggwhites. No, I’m afraid not. Egg beaters are pasteurized, so they won’t whip up as stiff as normal egg whites. What is the sodium count? It’s got 55mg per serving. Serving size is 4 cookies. These were delicious! I love how low in carbs they are. Me too. You can eat a whole bunch and still stay on your low carb diet.